JUNE 2, 2011 - "Wine--it's not something, it's someone!" 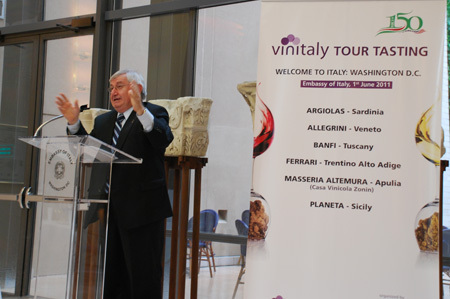 said Vittorio Vettori (above), Banfi's fine wine "ambassador" at the Vinitaly Tour Tasting held June 1, at the Italian Embassy in Washington. Vettori was referring to his view that wine reflects the heart and soul of the producer, and that the Banfi Family, which produces some of the best and most consistent Brunello wines, is a good example. At the tasting, Banfi presented an excellent 2004 Poggio alle Mura Brunello di Montalcino. Also well received was a 2008 Chardonnay Bianco produced in Sicily by Planeta. Jamie Stewart, who presented the wine, noted that in 25 years the Planeta Family "revolutionized the landcape of viticulture in Sicily." Though hard to find in the States, the Chardonnay is definitely worth a try. For a dessert wine, Antonio Argiolas presented an Argiolas Sardinia 2007 Bianco dessert IGT Isola dei Nuraghi. 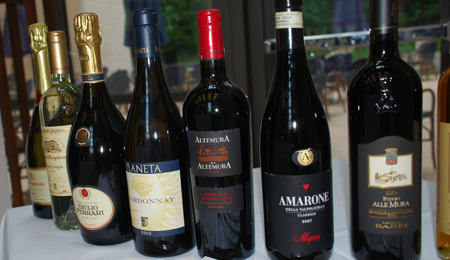 The VinItaly tasting event was organized by Stevie Kim, VeronaFiere senior advisor to the CEO.